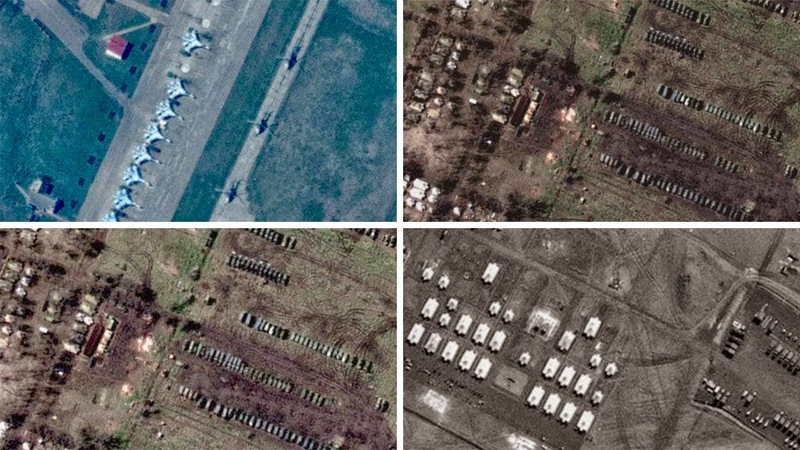 Russian RIA Novosti reports that it has received satellite photos, "which clearly show the accumulation of a large number of Ukrainian military equipment and weapons on the border with the Russian Federation and in the vicinity of Slavyasnk." RIA cites a source in the Russian Defense Ministry, who commented that the pictures show a military formation designed "to wipe out the city and all its inhabitants from the face of the earth." According to source, the group has more than 15,000 troops from the Ukraine army and national guard, about 160 tanks, 230 infantry fighting vehicles and APCs, and as much as 150 mortars, howitzers and multiple launch rocket systems ("Grad" and "Smerch"). The source concludes that "This concentration of troops in one area is not compatible with the potential of self-defense forces, armed with only a small number of pistols and submachine guns." Unknown assailants landed in helicopters and attacked a checkpoint in Soledar city in eastern Ukraine’s Donetsk region, a militia source told RIA Novosti adding that there is a fight going on. There is no information on the number of casualties. Soledar is located about 30 kilometers south east of Slavyansk. The people’s governor of Donbass region Denis Pushilin confirmed to RT that there is fighting in Soledar. As the unknown men attacked the checkpoint, the militia was forced to retreat, the source told RIA. The second checkpoint is preparing for attack he said, adding that there are about 50 activists, many without weapons. For now these skirmishes around "checkpoints" have been isolated events. But how long before the Ukraine "special forces" which may well amount to 15,000 troops as reported by Russian media, get involved. And how much longer after that until Russia retaliats. But the biggest question: who will be the agent provocateur who fires the first shot in hopes of launch an all out war? Indeed, who stands to gain the most from yet another war - one which will hardly be "contained"